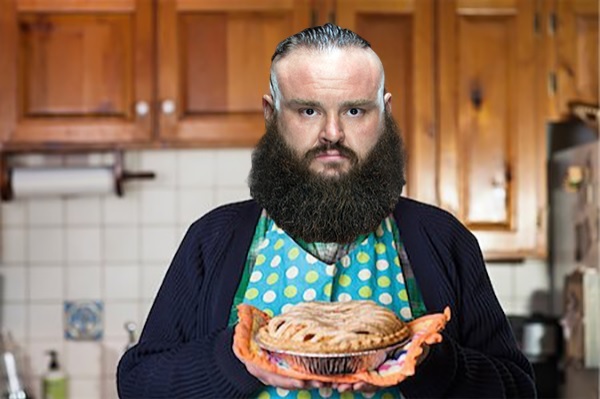 Headlies: Braun Strowman and Brock Lesnar To Continue Their Feud With A Pie-Eating Contest - WrestleCrap - The Very Worst of Pro Wrestling! Ontario, CA – Following last night’s brutal championship match at No Mercy, WWE Superstars Braun Strowman and Brock Lesnar have vowed to continue their feud. Strowman, living up to his “I’m not finished with you” mantra, issued another challenge to Lesnar directly after the conclusion of their match. WWE officials have been scrambling Monday to find a local bakery to provide enough pies for the two behemoths to consume. “Apple, blueberry, cherry, pumpkin, strawberry rhubarb, key lime, pecan, sweet potato, peach cobbler, we need it all!” shouted Vince McMahon during WWE’s pre-Raw meeting. 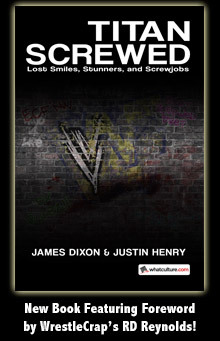 “What about cream pies, Vince?” asked Kevin Dunn to the shudders of many in attendance. To ensure a good, clean pie-eating contest, both Superstars will be covered in a tarp and Lesnar’s advocate Paul Heyman will be placed inside a shock cage and suspended above the ring. “Revenge is a dish best served a la mode!” laughed Strowman before wrapping a bib beneath his beard. 3 Responses to "Headlies: Braun Strowman and Brock Lesnar To Continue Their Feud With A Pie-Eating Contest"
I would totally get The Network just to see this. Unknown to anyone, Hornswoggle laced all the pies with Ex-Lax….